Deserves a place on every palette. A gorgeous forest green that is almost black in mass tone, it has great transparency, makes smooth, clean washes and lifts surprisingly well for a staining color. 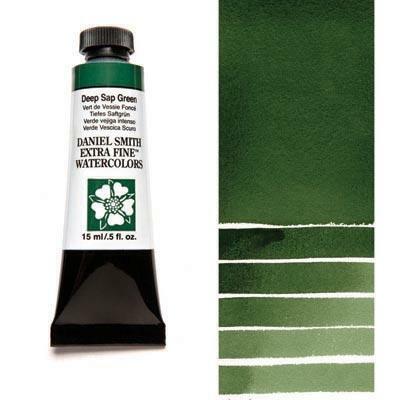 Made with a blend of three pigments, it joins our DANIEL SMITH family of impressively strong dark greens such as Jadeite Genuine and Perylene Green. Mix it with Pyrrol Orange to make a stellar redwood brown and Rhodonite Genuine for an interesting neutral blend.